Leveraging on our vast industry experience, we are providing a high quality range of Electric Halogen Heater 1400w. The offered heater is used in various industries. Procured from reliable vendors, this heater is manufactured under the vigilance of adept professionals using high grade components and modern techniques. This heater is precisely checked on numerous parameters to ensure its functionality in adherence to defined industry standards and norms. The General Aux Flora Instant Water Geyser Is An Efficient And Pocket-friendly Water Heating Appliance With A Capacity Of 3 Litres. Bring It Home And Heat Water Faster While Saving Energy At The Same Time. Design:-this Sleek Water Heater From General Aux Makes A Great Addition To Your Home Aesthetically As Well As Functionally. It Comes With A Stainless Steel Inner Tank And A Copper Heating Element.the Stainless Steel Inside Efficiently Contains The Heat So That Less Energy Is Consumed. Thanks To The Long Lasting Copper Heating Element, This Water Geyser Quickly Heats Water. This Geyser Delivers Efficiently By Consuming 3000 Watts Of Power. 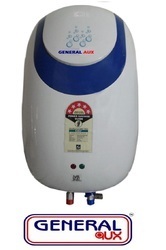 Safetyfor Your Safety, This General Aux Instant Water Geyser Comes With A Fusible Plug And Thermal Cutout. The Thermal Cutout Helps To Contain Situations Arising Due To Over-temperature Conditions. Safety tip-over switchChild safety mesh grillHigh temperature resistant plastic bodyWide angle oscillating functionThree powerful halogen heaters.Three heat settings 400 Watt/800 Watt and 1200 Watt.Tilt over seitch protection.In built over heating protection switchChild safety mesh grill. Looking for Electric Halogen Heater ?